I've been giving at a minimum of one good sewing session each weekend to working on crumbs/strings. More is great too, but one sewing session (1-2 hours). This way I will keep making progress on these, the dregs of my sewing room. I'm focusing right now on using up the smaller pieces of leftover blues from doing the recent upcycled blues project. This was the original plan. The blocks are under construction at the moment. They aren't hard, but I am sewing the small pieces onto adding machine tape first in order to make it easier on myself. I have two sizes of such tape - a narrower, standard size, and a wider size - which is closer to 4" wide. Before today I had 2 blocks all finished. During the week I worked on sewing a bunch of blues onto the narrower blue tape, but didn't do any on the wider. I was hoping to get enough to make all my inner round of the blocks, but I don't think I accomplished that. Oh.. do you want to see my new layout? Do you like how these projects are...um..."fluid"? Yes, they are, right up until I finish them - I am liable to change whatever I want until I like it. When I looked at exactly how large these blocks are, I decided that I really didn't want to make 16 of them. So, off to plan something else. This is what I came up with. That outer mishmash of stuff that looks like it's crazy represents more of that wider adding machine tape that I will sew scraps on to before sewing on to the top. It's almost 4" wide - so by the time I take out seam allowances, it will be just under 3.5" wide. My newest plan. I like it better than the first one. So what did I do on this project? 2. Made the rest of my 4.5" inner crumb centers - need a total of 9 - I actually have a few more than that. This is my thinner adding machine tape. 3. 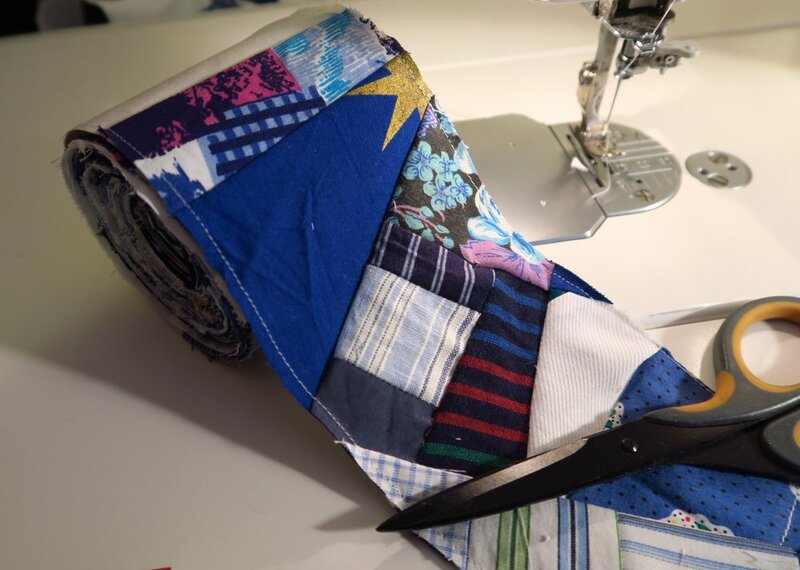 Sewed up several yards of blue scraps onto the narrow paper tape. I didn't measure exactly how much - just quite a bit. I did this during the week when I was tired of doing something more exacting. It's really mindless work and I don't mind doing it once in a while. 4. 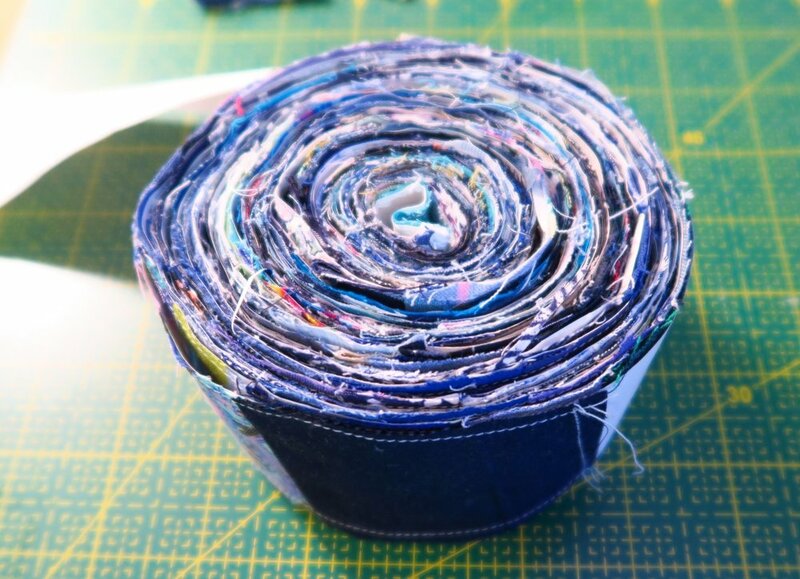 Sewed about 156" of blue scraps onto the wider paper tape. 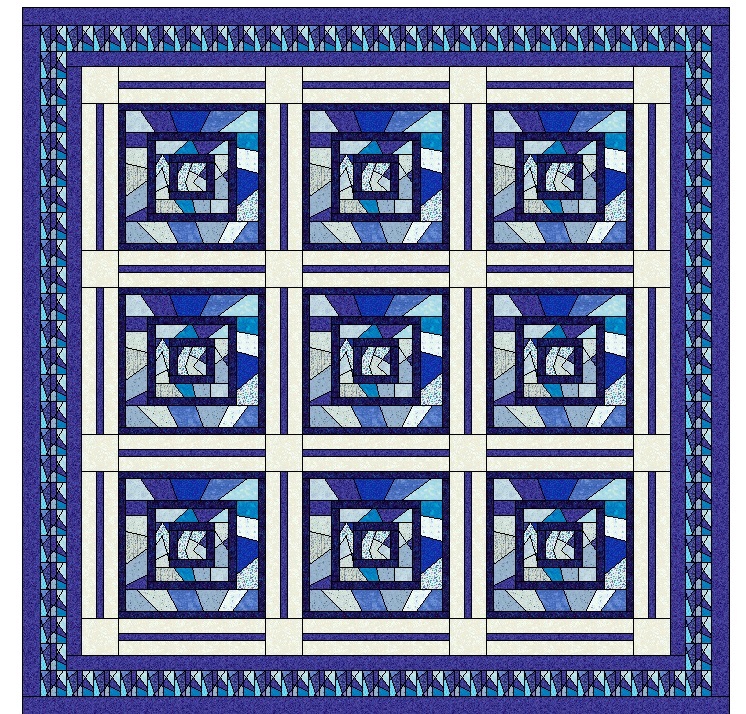 I used partial blocks and cut offs and even the rest of the side setting triangles from a couple of my other quilts. I will continue to use those in this top. 5. Finished 2 more blocks in entirety. These blocks are truly crazy, but they are growing on me. I actually do like them. I think I'm more excited about my plan than I was with the original one. This will help me work harder on them. But in truth, my heart wasn't in scraps and crumbs/strings this weekend - I really just wanted to push through on the other blues tops. But I made myself work on it at least some. Don't forget if you need something for your winter sewing, be sure to check out what my sister has for you over in her shop!